The Astoria triple concealed thermostatic shower valve with 8 inch shower head, wall mounted arm and slider rail kit. 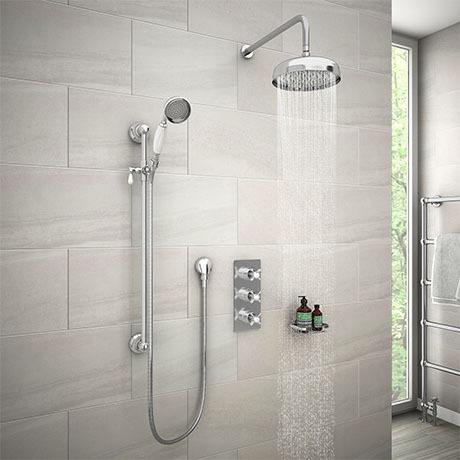 This concealed triple shower valve offers thermostatic showering via three easy-to-operate controls. Operates two shower accessories separately or simultaneously - Fixed head / Slide rail kit. Slider rail kit consists of a classic slide rail, 1.5 hose and shower handset. Manufactured using high quality chrome and brass, our range of Edwardian shower valves will look outstanding in any shower enclosure.